This post concerns total value creation (Marx) in a context of demand-determined output and employment (Kalecki, Keynes). A ‘macro rule’ employed by Marx seems central to this connection. Marx held that, in real terms, an hour of average living labor “always yields the same amount of value, independently of any variations in productivity” (Marx, 1990, Capital, Vol. 1, Penguin Edition, p. 137). Value in ‘real’ terms is expressed as an amount of socially necessary labor time, whereas ‘nominal’ value is expressed in terms of a monetary unit of account. If it is true, as Marx maintained, that an hour of average living labor always creates the same real value, then at the aggregate level, total ‘productive’ employment provides a straightforward measure of ‘new value added’. The following discussion assumes some knowledge covered in the Marx & MMT series (still in progress). To keep the presentation as short and simple as possible, repetition of that material will be minimized. But it is perhaps worth emphasizing that, unless stated otherwise, the term ‘labor’ should always be understood as abstract, socially necessary labor. ‘Abstract labor’ is the exertion of effort as such, without regard to its concrete form. ‘Socially necessary labor’ is labor performed with the average degree of productiveness. Further explanation is provided in an earlier post. all monetized, domestic economic activity occurs in the private, for-profit sector and is productive. In other words, fiscal policy is abstracted from, yet somehow private property rights are imagined to remain in force with a state money in operation. This is clearly unrealistic. But it means that the distinction between ‘productive’ and ‘unproductive’ labor can be ignored, as can the different treatments of depreciation in the analyses of Marx, on the one hand, and Kalecki and Keynes on the other. The implications of relaxing these simplifying assumptions are discussed in the final section. The focus, in what follows, is on period t. Variables with subscript t or t+1 refer to magnitudes prevailing at time t or t+1, respectively. Variables without a time subscript refer to processes that occur throughout the entire period. Strictly speaking, they should have the subscript t,t+1, but the subscripts are suppressed for ease of exposition. At time t, taken to be the beginning of the period, each firm plans the real level of production to be complete at time t+1. These planned levels of real output determined at the micro level, together with knowledge of technical and social conditions of production, imply for each firm a derived demand for materials and labor power. Firm i anticipates that production of its planned real output will require the performance of various kinds of (concrete) labor, in appropriate proportions, as well as estimated quantities of various material inputs available as commodities on the market. Obtaining these will require monetary advances that depend upon prevailing wage rates and prices of materials. In aggregate, the sum effect of all these enterprise-level calculations will be to arrive at monetary amounts for total money wages $Wt and total monetary materials cost $Mt. In Marx’s terms, the former is variable capital expressed in dollar terms $vt and the latter is constant capital, also expressed in dollar terms $ct. Following the ‘temporal single-system interpretation’ (TSSI) of Marx, the monetary values of constant and variable capital depend upon the prices that prevail at time t. In the case of constant capital, these prices are factored in by firms directly, since each firm must purchase inputs at going prices. In the case of variable capital, the influence is indirect, working through the impact of wage-goods prices on the setting of money wages. The monetary advance of variable capital is equal to the average money wage rate $wt multiplied by total employment. The monetary advance of constant capital will equal, though it is not shown above, the quantity of each input purchased, multiplied by its price at time t, summed over all inputs. Dividing the monetary measures of constant and variable capital by the temporal ‘monetary expression of labor time’ (MELT) of time t gives the equivalent real labor-time measures c and v. The MELT is the amount of monetary value created by an hour of average labor. It is the conversion factor between ‘real’ value, expressed in terms of labor time, and ‘nominal’ value, expressed in terms of a monetary unit of account (here, taken to be the dollar). The temporal MELT is discussed in more detail in a previous post. Surplus value s, expressed in real labor-time terms, can be deduced as the difference between total employment and variable capital: s = L – v. Rearranging gives L = v + s. Part of total employment is necessary to reproduce workers and their dependents. This is referred to as ‘necessary labor’ and equivalent to v. The rest is ‘surplus labor’ and equivalent to s.
where α is the marginal propensity to leak from the circular flow of income to taxes, saving and imports (though, at the moment, there are no taxes). Massimo De Angelis (here, subscription required) translates the Keynesian multiplier into Marx’s value categories and draws out some of the social implications. If we assume Keynesian (or Kaleckian) causation, real output is determined by the level of autonomous demand, given the marginal propensity to leak. For given productivity (or unit value), the level of employment, and hence new value added (L = v + s), depends on the level of demand-determined real output. Whenever there is a change in productivity, real output will vary relative to total employment (and new value added). In general, productivity varies with: (a) technology and (b) labor intensity. Keynesian output determination and the effect of a change in productivity are illustrated in the diagram below. The level of real output depends on total demand (aggregate expenditure AE). If productivity improves from ρ to ρ’ (or, equivalently, unit value falls from λ to λ’), then it takes less employment to produce the demand-determined level of real output. Employment will be L’ rather than L.
In the bottom panel, the red lines are rays drawn from the origin through the points indicating actual employment associated with real output level Y1. The slope of a ray indicates unit value at that level of output. 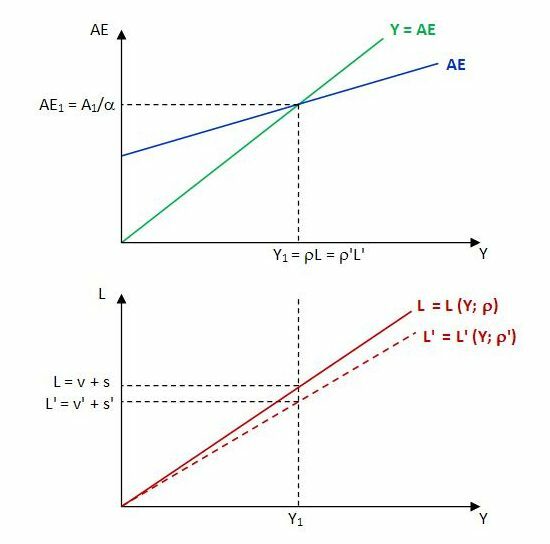 The diagram illustrates that, for a given level of demand, the effect of productivity improvements is to reduce both value added (L) and unit value (L/Y). There is just as much real (price-deflated) output. But there is less value, measured in real (labor-time) terms, to be distributed between workers and capitalists. The effect of rising productivity on value creation relates to Marx’s ‘law of the tendential fall in the rate of profit’. If, due to rising productivity, variable capital falls relative to constant capital as a result of it taking less living labor but the same materials to produce the demand-determined level of real output, then the ratio of new value added (L = v + s) to total capital (K = c + v) will tend to shrink. For a given rate of surplus value s/v – or, equivalently, for a given distribution of new value added – there will be a lower (temporally-calculated) rate of profit. At the same time, there is potential for real output to be expanded beyond its current level if total employment (and value creation) can be maintained. This is contingent on demand. In particular, total demand will need to grow sufficiently to offset the effect on employment of rising productivity. Stronger demand and employment will boost total surplus value. But, in the absence of fixed capital, this will not prevent the reduction in the rate of profit, since the production of additional output still requires the higher proportion of materials to living labor. Once fixed capital is included in the analysis, growth in demand can attenuate the tendency for the rate of profit to fall by encouraging a higher rate of capacity utilization. But this cannot eliminate Marx’s tendency indefinitely. In addition to demand growth, maintenance of the rate of profit in spite of productivity improvements requires either a redistribution of value in favor of capitalists (i.e. an increase in the rate of surplus value, but this is likely to depress demand) or a sufficient decline in the prices of the elements of constant capital. A reduction in the prices of the elements of constant capital reduces the value of total capital K in the denominator of the expression for the average rate of profit, s/K, and so, other factors remaining equal, boosts the rate of profit. From Marx’s perspective, then, stability in the rate of profit in the context of rising productivity requires that the prices of the elements of constant capital fall sufficiently to offset a rising ‘technical composition of capital’ (defined as the ratio of the mass of the means of production to living labor). This will cheapen investment. For Marx, the functional role of crises is to bring about a collapse in capital values and restore profitability. This will certainly increase the potential rate of profit (i.e. the rate that can be achieved if production both goes ahead and is fully realized in exchange). Even so, if we bear in mind the insights of Kalecki and Keynes, capital devaluation in itself will not be sufficient to ensure the stability of actual profitability, whether in produced or realized terms. For production of surplus value actually to occur, firms need to believe that there will be a demand for the final output. When the perspectives of Marx, Kalecki and Keynes are combined, a stable rate of profit would seem to require both conditions to be met: a sufficient reduction in input prices and sufficient autonomous demand expenditure. The macro-level connections between value creation and demand-determined output and employment have been simplified by abstracting from: (1) the role of the government sector; and (2) fixed capital. (1) As already noted, the abstraction from government was to avoid the distinction, in Marx, between productive and unproductive labor. In addition, it was assumed for simplicity that all private-sector labor is productive. However, for Marx, most public-sector labor and some private-sector labor is unproductive. He argued that, under capitalism, labor is productive if it: (i) is exchanged against money functioning as capital; and (ii) directly creates surplus value. Suppose, provisionally, that all private-sector employment is considered productive and public-sector employment unproductive. In that case, the dichotomy can be taken into account by: (i) subtracting government spending on wages and salaries from Gross Domestic Product (GDP) to arrive at Gross Private Product; and (ii) subtracting public-sector employment from total employment to arrive at private-sector employment. Let Gross Private Product be YP and private-sector employment LP. Then YP is a multiple of A’, where A’ is real net autonomous expenditure excluding government spending on wages and salaries. That is, YP = A’/α. Similarly, new value added is LP = λA’/α. The definition of unit value becomes LP/YP. The measure of productivity for Marx, YP/LP, will now diverge from the measure currently used in the National Accounts, since the latter, Y/L, is based on broader definitions of output and employment. Although public-sector pay and employment is now excluded, the private consumption expenditure of public-sector workers, being a form of private consumption expenditure, will still constitute a part of total demand and so influence total real output and private-sector value creation. The consumption expenditure of public-sector workers, like consumption in general, will be partly induced in accordance with the marginal propensity to consume and partly autonomous. It can also be noted that government expenditure on privately produced commodities will also influence (before-tax) Gross Private Product, through both its direct and multiplier effects. Dropping the provisional assumption, some private-sector labor is also deemed by Marx to be unproductive. This makes it necessary to subtract unproductive private-sector employment from total private-sector employment. But there appears to be no need to modify Gross Private Product. The pay of unproductive private-sector workers will come at the expense of private-sector profit, leaving Gross Private Product unaffected. (2) The different treatments of fixed capital are also simple enough to account for in theory. Marx included depreciation in constant capital. So, in his analysis, depreciation is not part of GDP. In contrast, Kalecki and Keynes, consistent with prevailing National Accounting conventions, include depreciation in gross profit. This makes depreciation part of GDP. For present purposes, the significance of this is that various macro-level correspondences (see here and here) between real labor-time, real use-value and nominal magnitudes apply in terms of Net Domestic Product (NDP) (i.e. GDP minus Depreciation) rather than GDP. For instance, in the absence of fixed capital, nominal new value added ($vt + $st+1) equals nominal GDP, whereas in the presence of fixed capital it equals nominal NDP.